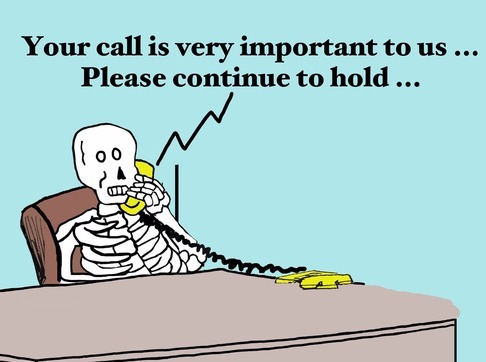 It's a truth universally acknowledged that few things irritate a customer more than being put on hold - not surprising when you consider a rather scary US study found that the average American consumer spends 43 days during their lifetime on hold (Business2Community). So what can you do to minimise the frustration caused to those customers who are trying to contact you? Invest in more customer service staff - obvious, but of course not always practicable, not least because of the cost of employing more staff, and the difficulty of finding a balance between having sufficient staff when it's busy and a surplus when it's quiet. Have a very detailed, wide-ranging list of FAQ on your website - the ideal solution is to answer just about all the questions your customers could possibly have, on your website, thereby minimising the number of people who ever need to call you. Don't forget to make sure that your FAQ are easy to find. Add live chat to your website - a customer service representative can deal with up to four customers simultaneously via live chat but only one customer on the phone. Plus many customers, particularly younger ones, prefer online interaction to a phone call. Offer to call back - nearly two-thirds of customers would prefer a call back option to waiting on hold. If you offer this option, make sure you call back within a reasonable period of time; around 50% of customers would expect a call back within 30 minutes (Customer Service Investigator). Change your hold music - a study in the Journal of Applied Social Psychology found that playing pop music instead of 'elevator' music makes callers less angry - probably beacause people associate those sorts of instrumentals with waiting or complaining, whereas pop music doesn't prime negative thoughts in the same way. Don't choose 'prosocial' music though - surprisingly, the same study found that using prosocial tunes as hold music, i.e those that include messages about behaviours that benefit society like 'Heal the World' actually made people angry. Have a fantastic hold script - there are a few components that every hold script should contain: an apology, a request for permission to place the customer on hold, an estimated time that they will be on hold for, and a thank you for agreeing to be put on hold. Finally, whenever you have put a customer on hold, ask if they'd be prepared to answer a short survey about their experience. This is such a crucial part of the overall customer experience that it's important to get it as right as you possibly can - learn from your mistakes.